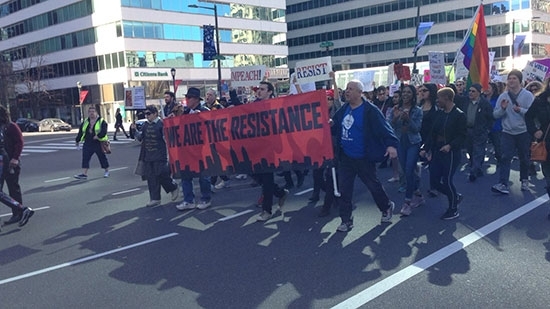 This afternoon protestors gathered in Center City Philadelphia for a 'Not My President's Day' rally. The demonstrators are taking advantage of the national holiday to voice their displeasure over current President Trump. Similar gatherings took place in cities across the country. At issue were a broad range of the administration's polices including immigration, health care, and the environment. They gathered at Thomas Paine Plaza across from City Hall for a number of speeches before marching to Independence Hall and back. President Trump announced his new pick for national security adviser on Monday from his Mar-a-lago club in Florida. He has chosen Army Lt. Gen. H.R. McMaster to fill the role left open by Michael Flynn last week. McMaster was born in Philadelphia in 1962. He graduated from Valley Forge Military Academy in 1980 and West Point in 1984. Trump interviewed four candidates over the weekend down in Florida. He called McMaster, "a man of tremendous talent and tremendous experience." Flynn was forced out of the position after it was revealed he had spoken to Russia's ambassador about sanctions. Trump had first offered the job to retired Vice Adm. Robert Harward, but he declined. The Sixers just keep acquiring assets. Some day they'll cash all those tickets in for the big prize, but in the meantime they just keep stockpiling them. Last night, the Sacramento Kings sent All-Star DeMarcus Cousins and Omri Casspi to the New Orleans Pelicans for Buddy Hield, Tyreke Evans, Langston Galloway (St. Joe's), and their 2017 first- and second-round picks. That probably means the Sixers are not trading Jahlil Okafor to New Orleans. The better news comes when you look at the hand of draft picks the 76ers are holding. Thanks to a 2015 trade with the Kings by former GM Sam Hinkie, the Sixers have the right to swap first round picks with Sacramento this year. Without Cousins, the 24-33 Kings are bound to drop in the standings. Although, right now, they sit at #11 in the lottery and we are at #5. It wouldn't make sense to swap if the season ended now, but it is lottery insurance against another 10-5 run to finish the season.